I figured it was about time for me to update my blog. The funny thing is, in my head I thought I would challenge myself to blog everyday in January. Ha! It's the 11th and this is my 2nd post. That shows how disciplined I am. Maybe I will try to conquer that in February, it's a shorter month. I am still tired, so tired, and maybe now just a little bit lazy? And the past week it has been FREEZING cold here. The real kind of freezing. So it has not been fun to get out. I have spent lots of time on my couch with my snuggie. So now I am going to talk about my week of TV. *First, Marcus and I watched Facing the Giants, finally. I loved it. Santa put it in his stocking this Christmas. A church in Georgia makes movies with all volunteers! Nobody gets paid, not even Kirk Cameron in Fireproof. We haven't seen Flywheel yet, but I guess that's next. * I just started watching The Office. My friend Courtney peer pressured me into it. Now I am a little bit addicted. The problem is that it's on TV like 4 or 5 times a day. I am trying to catch up on all of them, but they are out of order, so I get confused. I have tried to watch it in the past, but sometimes the awkwardness of Michael just kills me! I have gotten over that a little bit and now I think he's funny. Sometimes I still have to change the channel though if I can't handle it. 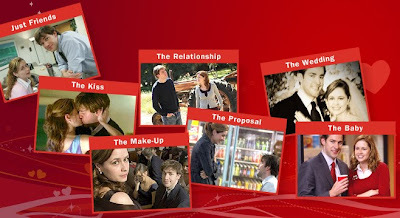 And I'm really watching it for Jim and Pam! * Speaking of awkward, The Bachelor! Sometimes those girls are just embarrassing themselves! I haven't watched tonight's episode yet, but I can't wait! This show makes me cringe a lot, but I can't stop watching it! * And finally, Chuck! I love this show. This is not normally the type of show that I like, but I love every second of it. The new season started last night with two of the best episodes. So this week it's supposed to be a little bit warmer and I am starting my second trimester, so maybe I will start to live my life a little more. We'll see. I did get to see my baby last week, so I'll tell you about that tomorrow. I have some Bachelor to watch now! I haven't seen any of those movies yet...I really need to. But...we are SO ALIKE when it comes to awkwardness and the tv. I have to watch the office and the Bachelor on dvr so that I can fast fwd through the parts that make me uncomfortable!! I think I must have watched about 15mins of the Batch last week. HA!! Yay for warmer weather...of course we are going to the Stock Show on Saturday...and it's only supposed to be 49 degrees. EEEK. We LOVE Facing the Giants.It's a awesome movie and so touching. The Bachelor was interesting tonight wasn't it? Hope your staying warm in Dallas. I hope the winters aren't so bad when we move there in a couple of months. Facing the Giants is a great movie. One of my all time favorites. You should check out Modern Family. It is irreverent like The Office. So funny. I hope you get your energy back soon. Can't wait to hear about the baby. I too just saw Facing the Giants last month. Loved it. I have never seen or heard of Flywheel. I will have to look into that one. The Bachelor last night. UGH! I knew it was going to be that one to get into trouble. I like Ali & Tenley. I think there was another one but can't think of who right now. Thank you for the update on Flywheel. I didn't know they had a new movie out and I'm excited to see it. 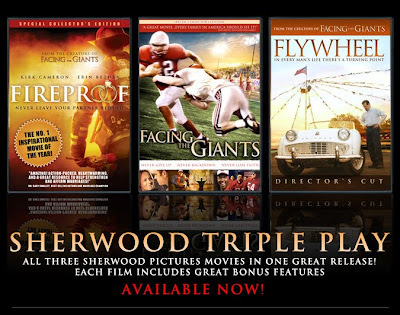 Oh goodness, Facing the Giants is so awesome - as are all the Sherwood movies. I know what you mean about the Bachelor! It is definitely my guilty pleasure. I mostly watch it to laugh because they are just plain silly sometimes.